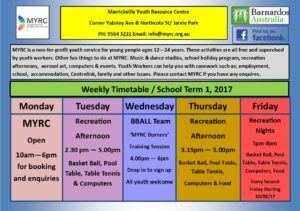 It’s that time of year again with school holidays just around the corner, and we have a jam packed holiday program for young people aged 12 to 18 years! These holiday activities include the MYRC open day, swimming, Skid Row Radio workshops, rock climbing, aerosol art, mini golf and art. Priority is given to young people living or going to school in Marrickville, and those from disadvantaged families. We can also support families with payments, please call us to discuss. We still have vacancies in all activities but they are limited, so get in quick! 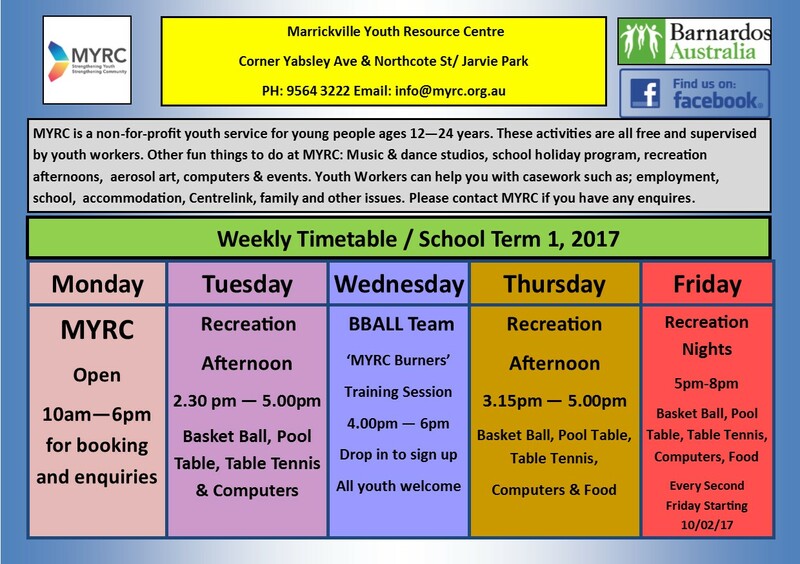 Check out the new weekly timetable with all the current activities happening at MYRC each week. 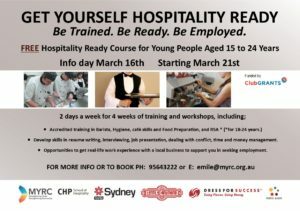 The MYRC Hospitality Ready program is FREE for Young people aged 15-24 and will commence on the Tuesday the 21st of March. MYRC runs the program in partnership with Canterbury Hurlstone Park School of Hospitality (CHP), Sydney TAFE, Metro Assist, Dress For Work and Lentil as Anything. This program aims to provide a practical course supporting young people in developing new skills, confidence, accreditation and work experience to gain employment in the hospitality industry. The program will run at MYRC and will also include visits to partnering organisations for work experience and workshops. Work experience at Lentil As Anything, Newtown. Professional clothing/styling for interviews (Dress For Work and Dress For Success). Resume writing and preparation for work session (Sydney TAFE). MYRC youth workers will also be available to provide additional support, advice and case work if required.